Developer : Vanilla Breeze Co., Ltd.
- We are here to support you! 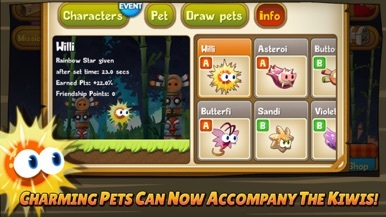 40 different pets to dash with! It's double the fun! 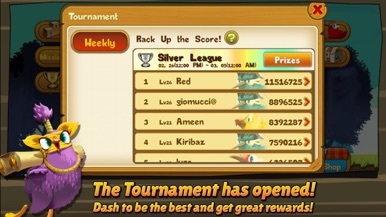 - Race on 6 spectacular maps! - With the help of friends, Relay is free! Social function is enhanced! - Doubles your final score! The Score Multiplier is finally here! - The greatest show on Earth, the Special Tournament has arrived! 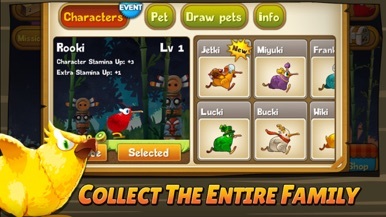 - Improved UI for users' ease of use! "Kiwis are also known as Chinese gooseberries"
I'm all about kiwis. Did you know you can eat the skin too, and that it's incredibly rich in antioxidants? For those of you picturing me munching a fuzzy brown bird as opposed to a fuzzy brown fruit, shame upon thee. 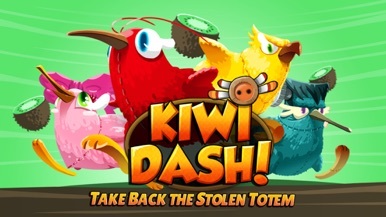 GAMEVIL USA, Inc's Kiwi Dash has both varieties of the K to the I to the W-I. Endlessly run as the variety with feet in order to collect as many of the variety with seeds as possible. Scoot a birdy boot through worlds stocked to the gills with the ripest of kiwifruit, skipping and leaping joyously in the air to catch the maximum amount possible without slipping off a cliff. This lil' kiwibird's somehow eclipsed his brethren and learned to take flight; however, he's only got the teeniest of stamina bars, so hover swiftly and with care. Avoid the dastardly cats, or dash directly into them for bonus boosts. Evolving challenges and purchasing power-ups keeps gameplay fresh and juicy. It's far from an original concept, but there's a reason endless runners have disseminated this far and continue to popularly propagate. This is a very well done ER, with a visual/audio design that's just as cute as can be coupled with precise, simple controls. The changing challenges keep you coming back to see what new techniques might bear fruit, too. 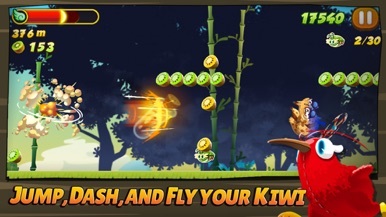 GAMEVIL USA, Inc's Kiwi Dash is a perfectly darling endless runner for fans of either variety of kiwi. Good for all ages, too.